JUST BEFORE CHRISTMAS, I RECEIVED WHAT COULD BE THE BEST EARLY CHRISTMAS PRESENT I COULD EVER RECEIVE, THE NEW MITCH MALLOY CD, ‘MAKING NOISE.’ UNFORTUNATELY, BEING CHRISTMAS I HAD SO MUCH TO PREPARE FOR. SO I OPENED THE PACKAGE AND PLACED THE CD ON THE KITCHEN COUNTER. I ANTICIPATED THAT I WOULD GET TO IT LATER IN THE DAY. AS LUCK WOULD HAVE IT, MY WIFE VENTURED OFF TO BED EARLY AND I WAS FREE TO DO AS I PLEASED. SO OFF I WENT INTO THE BASEMENT. A BEER IN ONE HAND, THE NEW MITCH MALLOY CD IN THE OTHER AND MY PHONE IN MY BACK POCKET. I QUICKLY PUT THE CD INTO THE PLAYER. WITHIN THE FIRST FEW SONGS, I GRABBED MY PHONE FROM MY BACK POCKET AND PROCEEDED TO MESSAGE MITCH. TO BE HONEST THIS WAS NOT MY FIRST BEER OF THE NIGHT, SO MY LIQUID COURAGE HAD SET IN. I THINK I SAID SOMETHING ALONG THE LINES OF THIS BEING A GREAT CD. MITCH QUICKLY RESPONDED. WE CONVERSED THROUGHOUT MY JOURNEY THROUGH THIS FANTASTIC NEW ALBUM. I WAS ECSTATIC. THIS WOULD BE THE FIRST TIME I HAD EVER GOTTEN A NEW CD AND ACTUALLY TALKED TO THE ARTIST THE WHOLE TIME WHILE I WAS LISTENING THE FIRST TIME THROUGH. WE TALKED ABOUT THE SONGS ON THE ALBUM AND OTHER BANDS WE WERE INTO AS WELL. LATER IN THE CONVERSATION, I WOULD COME TO FIND THAT MITCH WAS DRIVING WHILE HE WAS TALKING TO ME — HANDS FREE OF COURSE. I HADN’T KNOWN MITCH LONG, BUT FROM OUR RECENT CONVERSATIONS MY OPINION OF THIS MAN WAS THAT HE WAS SURPRISINGLY GENUINE. I IMMEDIATELY HAD NOTHING BUT THE UTMOST RESPECT FOR MITCH. AS THE NIGHT WORE ON I FOUND MYSELF REPEATING THE CD MANY TIMES. THE BEER WAS FLOWING NICELY, THE MOOD IN THE ROOM WAS AMBIENT AND I WAS TALKING TO MITCH MALLOY. WHAT A PRETTY AWESOME NIGHT. AFTER A LONG YEAR OF WORK, IT WAS NICE TO UNWIND, HAVE A FEW BEVERAGES, LISTEN TO NEW MUSIC AND CONVERSE WITH A MUSICIAN I TRULY ADMIRED. THE NEXT DAY WOULD BE DECEMBER 23RD, I WOULD WRITE THE REVIEW ON MITCH’S GREAT NEW CD AND GAVE IT A NOTHING SHORT OF ASTOUNDING. IT WOULD APPEAR THAT EVENING, I WAS STOKED AND HOPED THAT OTHERS WOULD ENJOY THIS GREAT ALBUM AS MUCH AS I HAD. UPON READING THE REVIEW ON CHRISTMAS EVE, MITCH WOULD MESSAGE ME AND THANK ME FOR THE KIND WORDS I HAD PUT FORTH REGARDING HIS LATEST EFFORT. I WAS VERY HAPPY HE WAS HAPPY. A GREAT PIECE OF WORK TRULY DESERVES A GREAT ACCOLADE. THIS WAS A MUSICIAN WHO DID EVERYTHING. NO HELP. A PURE MUSICIAN IN THE PURE SENSE OF THE WORDS. AS THE WEEKS PAST COMING UP TO TODAY, I WOULD SPEAK TO MITCH AT VARIOUS TIMES. AFTER MITCH HAD READ THE REVIEW OF HIS ALBUM, I ASKED HIM IF HE WOULD BE WILLING TO DO AN INTERVIEW. HE RESPONDED “YES” AND HERE IT IS. MITCH WAS OFF TO LA JUST BEFORE THE INTERVIEW TO ATTEND THE NAMM FESTIVAL AND HE HAD BEEN VERY BUSY LEADING UP TO HIS TRIP, PUTTING TOGETHER THE SHOW AND BUILDING A GUITAR FROM THE GROUND UP. HE STILL TOOK THE TIME FOR ME, TO WHICH I AM TRULY GRATEFUL. PLEASE ENJOY. THANK YOU MITCH MALLOY. Sleaze Roxx: Hey Mitch, it’s a pleasure to talk to you. 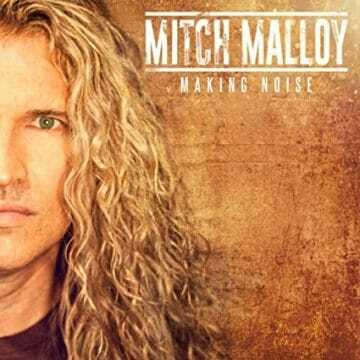 Great job on your latest album, ‘Making Noise’! It truly is a masterpiece. What approach did you take on this album as opposed to the albums in the past? I assume on the previous albums had you didn’t play all the instruments, write all the material and handle production duties? Was it a challenge with no other input from anyone? 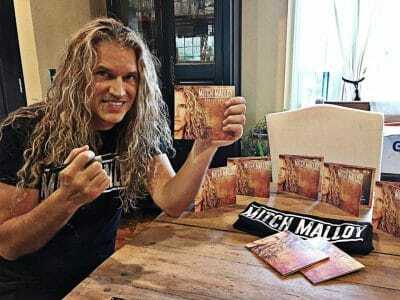 Mitch Malloy: I thought it might be but I was in the zone as I’d just produced a few CDs of bands and I thought it would be fun to just do everything myself. I finished “Life Has Just Begun”, then “My Therapy” and I thought “Yeah, I think I can do this.” I hope this doesn’t come off the wrong way but it was actually the fastest easiest CD I’ve ever made. I had a blast. Sleaze Roxx: The first single, “My Therapy” is really a solid, catchy track. What was the basis of the writing on this one? To me it seems there is some animosity towards someone, but then it turns to you remaining positive. 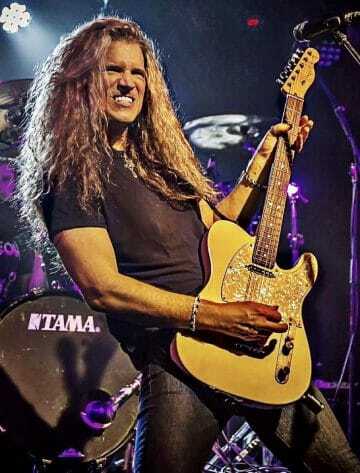 I will also add that the guitar to me has a great heavy rock tone and almost sounds to me as though it is tuned down a full step, giving it a nice heavy vibe. Mitch Malloy: It sounds like that but it’s not. It sounds like a drop D riff but it’s not. Well I’m not naming names but 2016 was full of drama and I had to deal with some extremely undesirable people. And that to be honest was a huge part of the reason I made this CD alone. And so, it was “My Therapy” to do that so that’s how that happened it was very REAL. Sleaze Roxx: I would really like to dive into some more of the material on ‘Making Noise.’ “One Way” is another track that I absolutely love. The groove and feel is very relaxed. I love that back and forth guitar-run on the intro. Can you give me a basis of what the inspiration for this song was in terms of the music and lyric wise? Mitch Malloy: Well, I’d written all these dark songs and sometimes you just balance yourself out. I know I do. At least I hope I do. So that song rolled out as a more positive uplifting song. Again it was VERY natural and effortless. It’s about my life. Sleaze Roxx: “Shook” is a song that I felt you were conveying feelings of dismay. Can you elaborate on this? It seems on various tracks there is a theme of saying “Screw it. I need to get this off my chest.” At the same time, you come across with the attitude “I will not be pushed around.” This song has a Lenny Kravitz feel to it. Was this intentional? Your bass playing on this track really shines as well. Mitch Malloy: Thank you. Yes, it’s a song about my life. And I was shook a LOT in 2016 so I hope I don’t have another tumultuous year like that ever again. I’m glad I could get it out in a song. That helped me a lot. Sleaze Roxx: Of all the tracks on the album, “Just A Word” is a beautiful piece of music and really adds depth to the album. Emotionally, you nail it perfectly. What was your approach on this one? I can’t help but notice a great Beatles vibe and your lyrics are very thought out. Sleaze Roxx: “I Was Wrong” may very well be my favourite track on the album. To me, it has so many different influences and styles throughout. The chorus is flat out genius songwriting. It really has a country feel to it. Was this intentional? From what I know you have a background in these types of catchy country songs with great changes? Mitch Malloy: Again, thanks so much. Country? Not intentional, no. I just do what comes out. And yes. I used to write country songs for a living but I’ve been gone from that for a long time now. Sleaze Roxx: The lead off track “Rock N’ Roll” is what it is, a great lead off track. Did you write it with that in mind? It’s just an overall fun song that really helps the listener ease into the album. Mitch Malloy: It’s my favourite actually. To me, that song is a smash. Sounds like a hit — so exciting. I am so proud of that song. Sleaze Roxx: In terms of gear on the album, what guitars did you use? What were you amp configurations? Mitch Malloy: Which guitars? Hum, ALL of them [lauhgs]. All the typical ones [sighs] — Les Pauls, Teles, Strats. Deacci Pickups. Kemper and Atomic Amplifiers. 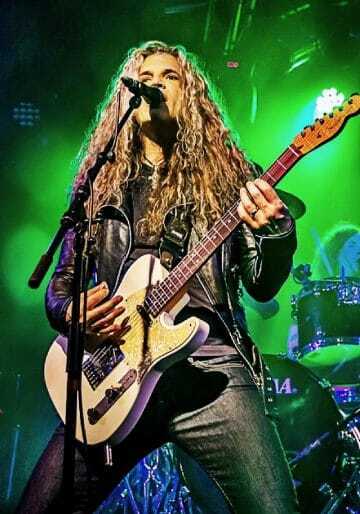 Sleaze Roxx: I’d like to change gears a bit and talk about the now infamous “Mitch Malloy is Van Halen’s third singer.” This has been well publicized in the last few years, so I’d like to maybe get a different twist on things. Initially, when you first received the phone call from Eddie Van Halen, what were your initial thoughts? Was this something that you dove right into or were there thoughts of skepticism being that you would be the third singer for Van Halen? Mitch Malloy: Very skeptical actually. Funny how timing is. That seems like a lifetime ago. We made some good music though. Funny someone likened me to early Dave the other day after seeing me do a Dave EV song. Ha!! Just because I can hit the notes and sort of remind some people of Dave doesn’t mean I’m anything like Dave. Way closer to Sammy actually but again not intentionally. Neither are my vocal influences. But great in their own right though. It’s just funny to me when people call me a Sammy copy or a Dave copy referring to me with Van Halen. Neither of them influenced me as a singer or writer. People do have some interesting opinions though. 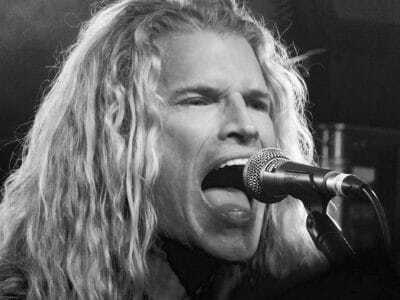 Sleaze Roxx: Was it ever said how Van Halen came to learn of Mitch Malloy? I mean you received semi-success with your first album, so your name and face was out there. Just curious if it was through word of mouth or if the band was a fan of your music. Sleaze Roxx: So you went down to the infamous “5150” studios and rehearsed with the band. I have to ask, is there a room full of master tapes? And did Eddie ever pull any of them out and play them for you? Unreleased stuff that diehard Van Halen fans would be foaming at the mouth to hear. Mitch Malloy: There is and he did not. We were busy starting a band [laughs]. 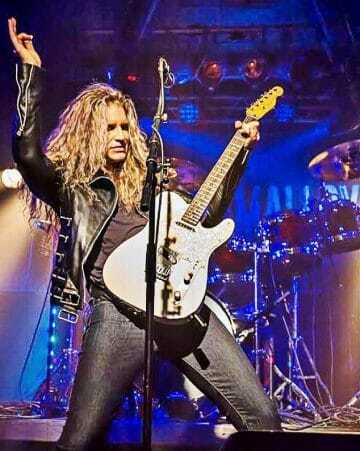 Sleaze Roxx: Mitch, I know you have to run to catch that plane to L.A. for the NAMM convention. Thank you for taking the time to talk. It’s been a pleasure and safe travels!!! Mitch Malloy: You are welcome!! !